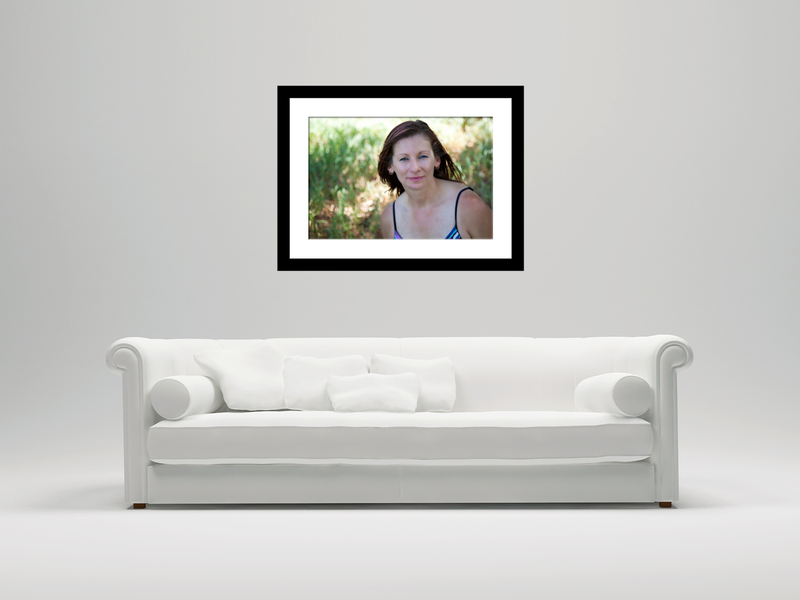 Have you ever wondered how you would display your images after a photo session with me? Well here's some ideas that might get your creative juices flowing. This first idea would have to be one of my favourites. All black and white photos, white (Ikea?) 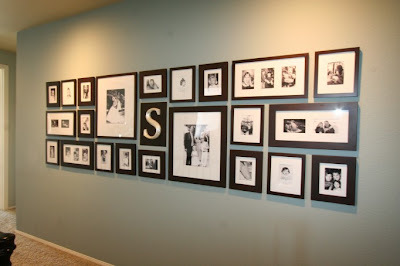 frames in a grid of 9 all displayed on a dark chocolate wall. Doesn't it make them pop? Here's some more symmetry with this example still using black and white photos but all the frames are different thicknesses and some are singles and some are triptyches....still works. I love that they have added a "S" to the mix. 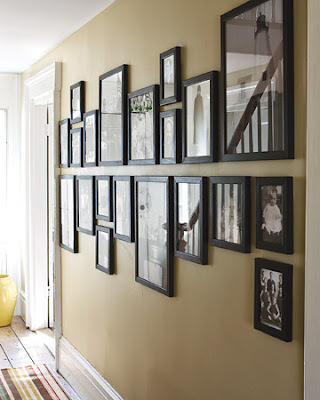 The tip is to lay it all out on the floor before you begin, measuring the overall width and height and mark this on the wall to get it in the centre. This next one I think is a ingenious idea. Just draw two parallel lines where you want the top of the bottom row and bottom of the top row (got that?) and line them all up. 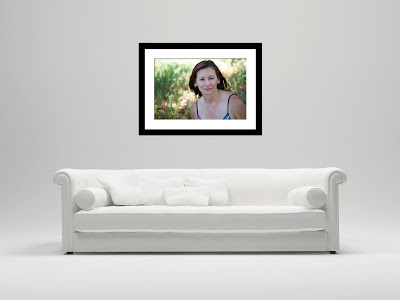 Again I think they are all Black and white photos in various black frames look fantastic! Your eye is lead down the hallway. Now for something a little more "random" yet still in a recognisable shape.....a heart. 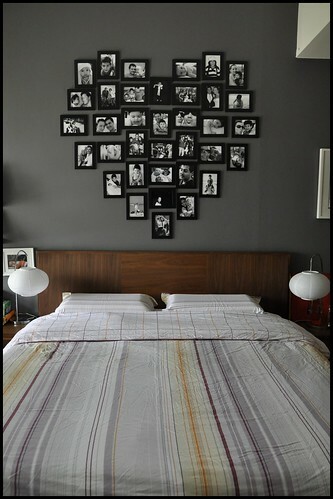 Great use of small frames and being above a bed makes it all the more personal. 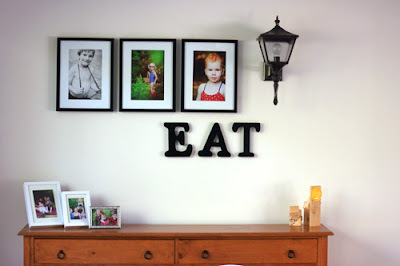 Want something simple, uncomplicated, easier to hang? Then maybe the triptych is more your style. Three photos hung side by side and can even be a combination of colour and black and white. OK I think I have overloaded you with enough to think about today, I was going to show you what you can do with canvases too but I will save that for another post. I will share with you a couple more images that my clients receive as part of their proofs following a photo session with me. 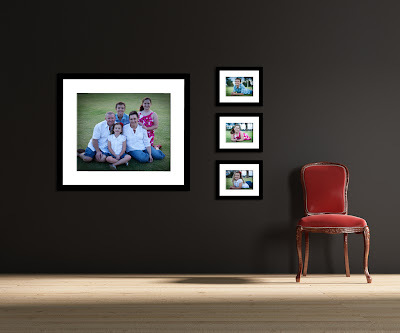 So you can visualise size and combinations of framed images I mock up (using the photos from your shoot) a wall of framed (and canvas) images.....your own images......from your session. Here's a couple of examples of what I mean. 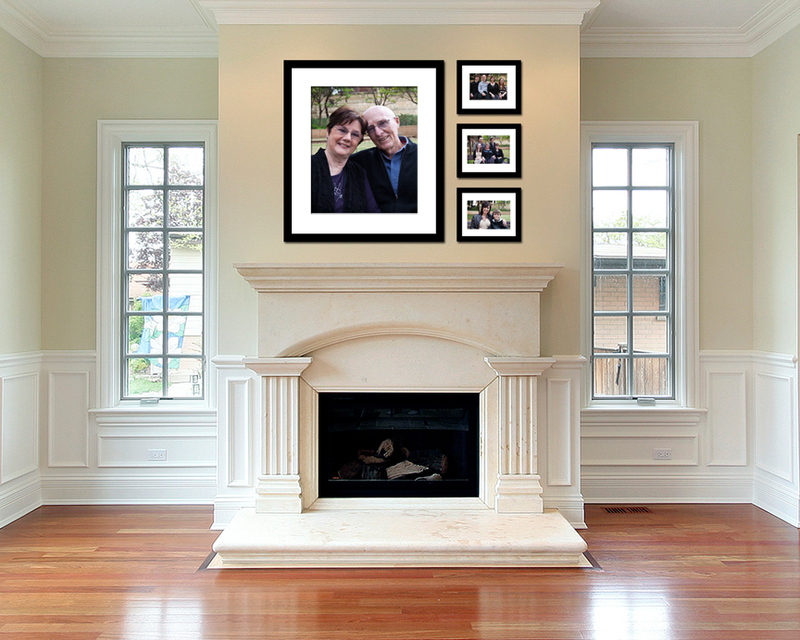 I love that I can show you visually what your memories will look like on the wall and help you make the most of your investment! I will help you select the perfect combinations to suit your available space and decor. P.S. sorry Blogger is not playing nice tonight....please excuse the shabby formatting!